Have you ever wondered what that beautiful deciduous tree is in your neighborhood? Even without leaves, flowers and fruit to help you, winter’s a great time to identify trees. The tree’s bark, buds and twigs and the sad remaining leaves provide great clues. Kick around the litter at the bottom of the tree and you might find intact leaves or seeds you can collect. With a little curiosity and time you’ll enjoy exploring nature in the city and learning about trees and shrubs during the winter. Here are some of the winter features that will help you to identify a tree. Is the bark smooth, rough or furrowed? Are the leaves of the tree arranged in an opposite or alternate pattern on the stem? You can identify this arrangement even when there are no leaves on the tree by observing the leaf bud placement on the stems in an area called the leaf node. Opposite leaves means that the leaves are arranged in pairs – each leaf has a leaf opposite it on the stem. Alternate leaves have gaps in their arrangement so the leaf appears singly, not as a pair and they spiral around the stem. Sometimes you will find a whorled arrangement, where a circle of leaf buds will be visible around the stem at the leaf node though this is more common with evergreens. Look at where the bud is placed on the stem to identify the arrangement type. Examples of Alternate Leaf Arrangement: Oak, Chestnut, Zelkova, Walnut, Beech, Birch, Hawthorn, Fruit Trees (Apple, crabapple, pear, plum ,cherry, peach), Redbud, Alder, Dove Tree, Willow, Linden, Elm, Aspen, Cottonwood and more! Additionally the size and shape of the terminal bud located at the growing tip of each stem can help you to identify a tree. Some trees have a very large terminal bud, or they are very hairy or at times may be a flower bud for next year’s bloom. An example of a sharply pointed terminal bud can be seen on the River Birch. Sometimes the primary or terminal bud can be a distinctive color as with many Maples. Are the buds naked or hairy? Buds can be covered in scales to protect them, and these are sometimes visibly hairy. A naked bud will not have scales over the leaf and you can see the tightly folded leaf on the stem. Black Walnut is an example of a tree that does not have bud scales. There can be a variation of numbers of scales on the buds and this can be diagnostic per tree species. Is the inside of the twig pithy? 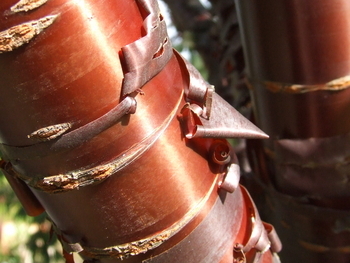 While we do not recommend arbitrarily trimming trees that do not belong to you, with permission and on your own plants you can get an idea of what kind of tree you are admiring by cutting open a twig to see what the pith looks like inside of it. The pith is the soft sponge-like material inside the twig. Take a small sample from newer growth and cut the twig lengthwise to expose the pith. Some trees will have chambers within the pith, like Walnuts, while others will have a continuous “filling”. Some will be intact with no pith at all. Are there identifiable leaves or seeds in the debris below the tree? If the leaf litter is still in place under the tree it is often useful to kick through it to find intact leaves, even if in skeleton form and to look for seeds to help you identify the tree. Horse Chestnuts leaves may have totally fallen apart but the shiny seeds that have popped out of the spiky capsules could still be on the ground and they are very recognizable! Maple tree samaras, or the winged pairs of seeds that spin like helicopters when they fall (or we toss them into the air), are very diagnostic. Are there winter flowers on the tree? Along with finding seeds on the ground look up into the trees to find winter blooms in the form of catkins on the stems. This includes Hazelnut, Alder, Willow and Cottonwood trees and often signals that spring is right around the corner. And then there is the winter blooming Higan Cherry, Prunus subhirtella, which has spurts of airy pink flowers throughout our dark winter days. Additional features to look for include if the tree has thorns or spines on the stems, if the buds are resinous and if the young twigs differ in color from the older stems and branches. So grab your observation skills, your pruners and your camera and head outside. Enjoy the ongoing adventure!